There is a house of spirits at the heart of Belmond Napasai. Found in almost every Thai home and known locally as san phra phum, this intricate shrine is said to ensure a sense of serenity and calm. It might be the work of the spirit house alone, but we suspect that the hotel’s unrivalled access to nature has a part to play too. You can’t help but feel at peace here. NESTLED IN THE HILLS of the northern coast of Koh Samui, you’ll find Belmond Napasai, enveloped in acres of lush greenery. Our villas are tucked between cashew and coconut groves, amidst blooms of hibiscus and branches of bougainvillea. After we’ve welcomed you with coconut ice cream, wander through our gardens to meet our resident water buffaloes. 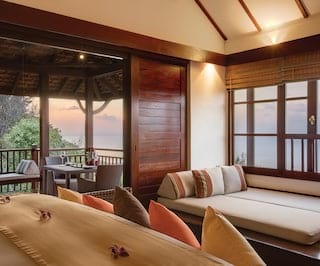 Through our doors, teak furnishings bring the feel of nature inside, while traditional weavings and cotton drapes billow in the breeze. The hardest decision you’ll have to make is whether to look out onto the sugar-white sands of the beach or the rambling wild of the jungle. Want to get even closer to nature? The hotel has its own speedboat for up to eight passengers. Glide through the gulf to find the best spots for snorkelling or head further afield to the Ang Thong National Marine Park. If your sea legs are a little shaky, spend the day on shore practising yoga on the skydeck. Alternatively, get your adrenalin pumping learning the “art of eight limbs” with a Muay-Thai boxing course. Those in search of more peaceful pursuits might wish to unwind beside our freshwater infinity pool. With stunning ocean views, it’s the perfect place for cocktails at sunset. Delight in Thailand’s freshest ingredients as the sky turns pink. Napasai Spa offers rejuvenative treatments rooted in Oriental philosophies. Local herbs and botanical blooms are incorporated into our signature body wraps, massages and facials. 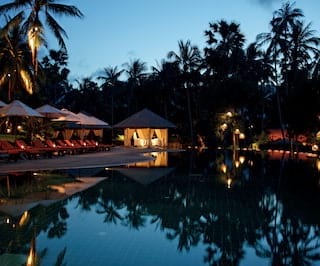 Come nightfall, the hotel grounds are lit with fire torches and fairy lights strung through the trees. 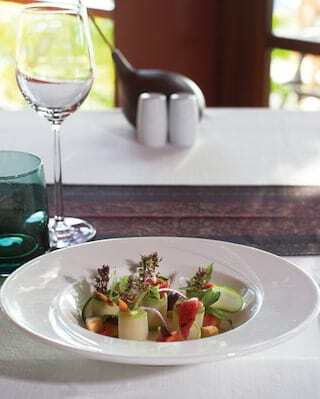 Enjoy Mediterranean and Asian dishes at our fine-dining restaurant, Lai Thai, or tiptoe towards the sound of the sea and find our beach restaurant. Try our traditional hotpot or expertly-prepared local seafood as the waves lap gently on the shore. On the way back to your hillside villa, breathe in the delicate scent of frangipani mixed with the sea breeze. Spirits are surely at play here.